The Ten Ancestors are a set of ten Ayleid statues. They consist mostly of meteoric iron prongs, with a shard of meteoric glass in the center. 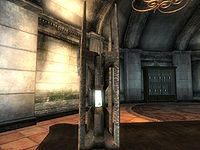 The statues played an important role in Ayleid religion and were displayed in the Temple of the Ancestors, now known as the White-Gold Tower. The temple of Loriasel was also built in Black Marsh by the Barsaebic Ayleids in veneration of the Ancestors. The Ancestors themselves were believed to worship the Daedra, and Daedraphile Ayleids accordingly followed the Eleven Edicts of the Ten Ancestors. The Heretic of Lindai was known for writing the Eleven OTHER Edicts of the Ten Ancestors, a parody that supposed the Ancestors worshipped Auri-El instead. During the Alessian Slave Rebellion, the Ancestors were dispersed to cities across Cyrodiil for safekeeping (specifically Culotte, Fanacas, Mackamentain, Moranda, Ninendava, Vilverin, Welke, Wendelbek, Wendir and Wenyandawik). Following the sacking of White-Gold and the Ayleid exodus of Cyrodiil, the statues were left behind and forgotten. In 3E 433, an Altmer nobleman called Umbacano paid the Champion of Cyrodiil to hunt down the Ten Ancestors so that he could add them to his collection of Ayleid antiquities. He then put them on display in his private manor in the Imperial City, before his untimely death that same year while exploring the ruins of Nenalata. The Ayleids seemingly structured personal memoirs into ten chapters in reference to the Ten Ancestors. Umbacano believed that ten of the ancient statues still existed when he began his search, implying that there may have been more at some point. For game-specific information, see the Oblivion entry.